Captain Ron and the crew would like to invite you to enjoy the great deep sea fishing the Biloxi/Gulfport Mississippi Gulf Coast has to offer. Whether it's bottom fishing and trolling the deep water sites to surf fishing at one of the gulf coast beautiful barrier islands of Biloxi. At Captain Ron's we can accommodate from 1 to 15 passengers aboard our vessel. And offer a wide variety of trip packages from Headboat to private Charters. 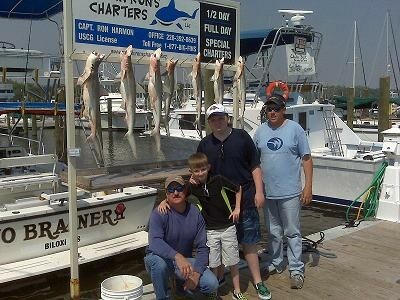 Whether you are seeking a day of deep sea fishing at one of the many deep water sites. To a day of light tackle action inshore, Captain Ron's has a package that's right for you. For a list of all the different types of deep sea charter trips offered and even book a trip with us online, please see Book a Charter , And enjoy your visit to Biloxi, Mississippi.